Give it up for the humble gastropod, particularly those with shells. They’re a garden nuisance to some, but a pest control measure for others. They can be a savoured culinary delicacy or the essential ingredient in a miracle face cream. And those multifaceted molluscs can be a skin-tingling creepy-crawly to plenty of folk, while others keep and care for them as adored household pets. Snails are truly versatile creatures and it’s no surprise considering the wide variety of the species. There are an estimated 43,000 different gastropod species on this planet, on land, in freshwater, and in the sea. Here, we’ll tell you how to know your Helix aspersa from your Achatina, and which will give your escargot a bit more go-go. The snails we most commonly see in our gardens or parks are Roman snails, Helix pomatia, that are more interesting than one might think. After all, how many other creatures can claim to have thousands of teeth, but only one foot? These snails are also unique in their reproductive behaviour; they are hermaphrodites, functioning as both sexes, and use a ‘love dart’ that is fired into their mate’s body to fertilize each other. Their nearest relatives, the Helicid snails, also use the love dart technique. The dating game must be a cagey business, however, the Wolf snail, Euglandia rosea, is a predatory creature that eats other snails. Measuring up to ten centimetres in length and found mostly in South America, they buck the traditional trend of snails being slow, moving at up to three times the speed of other snail species. The Wolf snail stalks its prey by following their slime trail. They’ve even been known to pursue a potential meal underwater and up trees. Its sensitive lips can detect what type of snail their quarry is, and they are cannibals too, often eating other Wolf snails. When it comes to delicacies, snails often top most lists, but not all species are edible and many are too small to be worth the bother of preparation. The common Roman snail is a popular choice for the escargot chef, as is the Garden snail, Cornu aspersum, which was originally found only in Europe but has spread as far as subtropical regions. 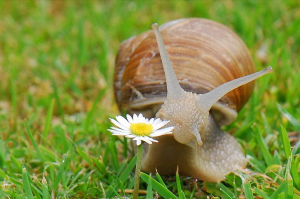 The Garden snail is the one we would most often find munching on our vegetable patch or flowerbed after a watering. Being found only in France and Spain, the Quimper snail, Elona quimperiana, has its work cut out to avoid being on the menu, too. Its delicious flesh makes it sought after for fine dining. Popular as pets, the Giant African snail, Achatina achatina, is a whole lot of mollusk. They can easily grow to a length of eighteen centimetres, with a diameter of nine centimetres – that’s going to leave quite a slime trail. Some have even been observed in the wild at a size of thirty centimetres long. They are prized as pets not just because of their size but also for the beauty in their distinctive conical shells that leads some to call them Tiger snails. US customs routinely confiscates large numbers of these coveted pets, as they have no natural predators and pose a serious threat to any ecosystem that they might escape into. They are already considered an invasive species pest in the state of Florida. These heavyweights of the snail world can do a lot of damage in their relatively long lifespan of five to six years. 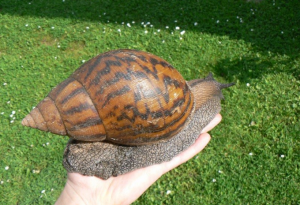 There are also Giant East African snails, Achatina fulica, which have been found as far away from home as China and Bhutan. As an invasive species this mega-snail not only munches at crops but also carries diseases and pathogens that damage native species. And the Giant West African snail, Archachatina marginata, distinctive by its woven-looking shell and light-coloured flesh, was originally found in Cameroon but has somehow made its way to Martinique. 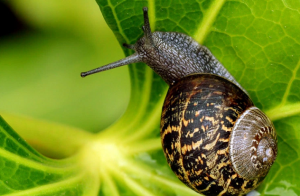 This snail not only devastates agriculture, but also is a carrier for the rat lungworm disease, which can cause meningoencephalitis in humans. Snails are just as plentiful in our seas, lakes and rivers as they are on land. 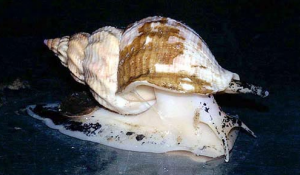 Most familiar is the common Whelk, Buccinum undatum, which lives in cold Atlantic water. Often hard to spot due to their shells being camouflaged with barnacles, whelks can live for up to fifteen years and grow as long as eleven centimetres. Like most sea snails, the whelk has an advantage over its land-dwelling cousins – it has a lid on its shell that can be closed for protection. And, again unlike land snails, whelks have separate sexes, mating in springtime’s warmer waters. They’re canny hunters too, drilling into other molluscs’ shells to get at the soft flesh inside. To feast on a mussel, they wait in front until it has to open, then jam a tube-like organ called a siphon into the open shell to feed. This is just a sample of the vast array of snails that share our planet. Hopefully we’ll have inspired you to go take a closer look in your own garden or park. Happy trails!